“Your Business” is a show on MSNBC showcasing the challenges and successes of small businesses across the country. Recently, the host of “Your Business,” JJ Ramberg, traveled down to West Virginia to work with Charlotte, NC based GTT cameramen, Nick Modisett and Roger Woodruff (who is now in Nashville!). 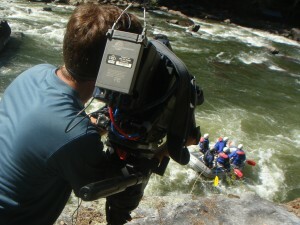 The piece was on the merging of three whitewater rafting companies. Check out the story to get all the details. The cool part about this shoot was the different HD cameras and equipment we used to get the fun whitewater rafting actions shots. Our main camera was the Panasonic HDX900. When it came time to get wet, we put a Sony V1u in a splash-bag and rolled down the river. To get some interesting point of view shots, we strapped a Go Pro camera on JJ and a few random whitewater instructors and let them do what they do best, have fun on the river! They came away with some super cool action shots. Check it out. Nick Modisett with the HDX900 and JJ Ramberg with the Go Pro strapped on her helmet.